This year September is about French macarons. I’ll have a new macaron variation for you each week. 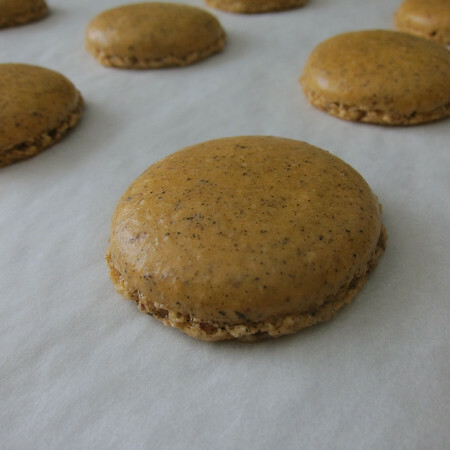 Let’s kick the unofficial start of fall off with an earl grey macaron filled with orange marmalade Italian buttercream. Infusing tea into macaron shells is a clever way of adding additional sense experience to the macaron eating experience. Uhm. What I mean is that, as most people know, smell is an important element of the eating experience. Earl grey has a wonderful floral and citrus nose to it. So, even before you take your first bite, the seduction begins with the scent of oranges. It works the same with other tea varietals…chai…green…lapsang soughing (okay fine, I just wanted to type that last one). Buttercream, Italian or otherwise is also a great bet for filling macarons. On its own, the filling is rich but stable (no need to worry about it squeezing out the sides). It’s also a great neutral beginning to a host of added flavors. In this recipe I’ve whipped in some orange marmalade. Another fabulous thing about Italian buttercream is that sealed tightly in a ziplock freezer bag (don’t forget to label), it freezes extremely well. This allows you to cut-off a frozen hunk, thaw it, add-in your choice of flavorings and then fill a dozen or so at a time. A final note on aesthetics. 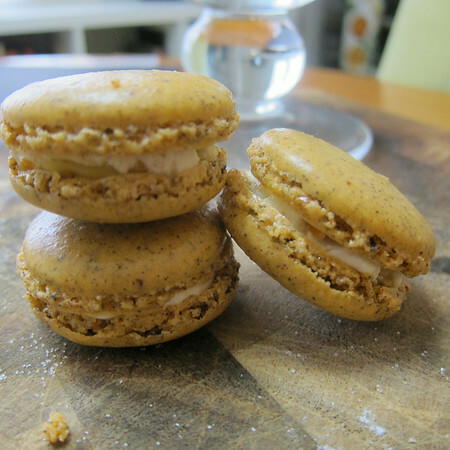 I’ve seen earl grey macarons in multiple macarooneries (if this isn’t already a word I’m claiming it). However, they are often colored grey or even lavender. I’m not really pro-grey food and I think the lavender is misleading. So, in this recipe I added just a couple of drops of orange food gel coloring. After all, earl grey tea gets its characteristic citrus scent from bergamot oranges (though, if I’m being honest, bergamots are actually yellow, not orange). I also like how the light hue allows the speckles from the ground tea to show through. Next week, a nod to Fiesta Hermosa (and no, I’m not making an edible driftwood clock or bedazzled acid-wash demin purse). I have found the best way to get consist results with macarons is to use weight measurements. In a food processor fitted with a blade, pulse together almond meal, tea and confectioner’s sugar. Give it a few pulses then sift into a medium bowl. Set aside. Add-in your gel coloring if desired. When the batter is ready, pour it into your piping bag. To be honest, I don’t bother with a tip, I just snip the bag about an inch or so from the tip (eh…maybe a little less). And another thing. You could half this recipe and still have enough to fill several dozen macarons. 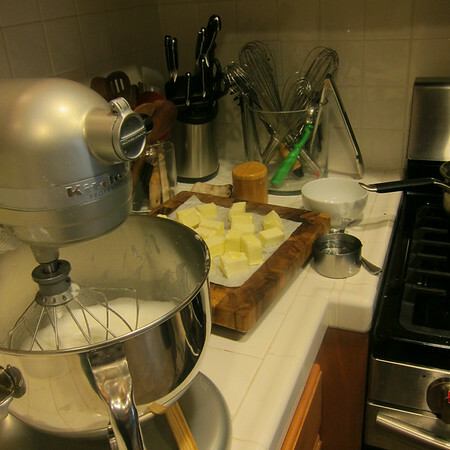 Start with this recipe for Italian Buttercream from Gourmet Magazine (sniffle). For a single batch of macarons you’ll only need a quarter of the buttercream (at most). To the portioned buttercream add about 1/2 cup of orange marmalade. Whip frosting to incorporate. Frost macarons as desired. Store remaining frosting in a sealed container in fridge (eh…maybe a week) or freezer (up to a couple of months).